Tulsidas was a Hindu poet-saint, reformer and philosopher renowned for his devotion to the god Rama. Tulsidasji is believed to be the paramount saint, poet, philosopher and more importantly an unwavering devotee of Lord Ram born in the 15th century. His universally renowned Ram Charit Maanas is beleived to be the saviour of the Hindu Dharma at a time when humanity was faced with great distress. His own life, though full of dejection and sorrow, was full of humility and was simple. He is one of those poets whose creations and devotion command respect and the following is just a brief and humble attempt to reveal his life. Tulsidasji was born in Rajapur, in the district of Banda in Uttar Pradesh on the 9th day of the holy month of Shravan, Samvant 1554 (1497AD). He was born to Atmaram Shukla Dube (Father) and Hulasi (Mother). By birth he was a Sariyuparina Brahmin and due to the unique cosmic confluence at the time of his birth; he was born at gestation period of 12 months with a full set of teeth and a body of a 5 year old. He was given the name of Rambola. Due to being considered inauspicious, he endured separation from his parents from birth and was raised by Chuniya, his maid until the age of five.From early childhood, he came in to contact with sadhus and saints who guided him towards the devotion of Lord Ram. He met his guru Shri Naraharidasji in Sukarksethra, and through his spiritual encouragement, guidance and narration, he understood the Ramayana and became a deep devotee of Lord Ram. Tulsidasji married a girl named Ratnavali (Buddhimati) in Samvant 1583. He was deeply affectionate and passionately attached to his wife. It is said that one day Ratnavali went to her father?s house, and Tulsidasji, unable to bear one night?s separation from his wife, clandestinely went to see her at night, enduring a fierce storm and in the process used a corpse for a boat and a snake for a rope. Ratnavali was intensely disturbed by such action and admonished Tulsidasji. She made him realise that infatuation and lust for the human body was only a superficial desire, and that immortal bliss could only be attained by deep devotion and love for the Almighty lord. Thus Tulsidasji renounced all materialism and became an ascetic ? this was the biggest turning point in his life. He spent fourteen years in visiting various sacred places of pilgrimage and in Samvant 1607 he attained darshan of Lord Ram in Chitrakoot. Tulsidasji had realised that many of society?s problems lay instilled in how the masses were illiterate and were unable to understand the true meaning of the Holy Scriptures. 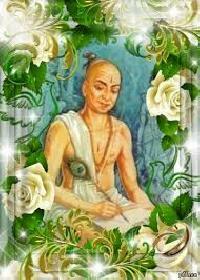 Thus Tulsidasji wrote his scriptures in the simple Braja-Bhasha, which the people understood. He visited Ayodhya where he wrote the most famous scripture the Ram Charit Maanas in Samvant 1631, while being narrated to by Lord Shiva. He wrote 16 scriptures in total (some say 22) including, the Vinay Patrika, Dohavali, Kavitavali and Hanuman Chalisa. Tulsidasji retired in Kashi and attained param moksha on the 3rd day of Shravan Maas, Samvant 1680 (1623AD) at the age of 126 at Asee Ghat on the banks of the river Ganges. Tulsidas was born at the 7th day in the month of Shraavana (July or August), in the bright half of the lunar. His birth place is identified at the Rajapur (also known as the Chitrakuta) at the banks of the Yamuna river in UP. The name of his parents is Hulsi and Atmaram Dubey. 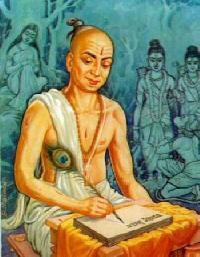 According to the biographers, various opinions are there regarding the birth year of Tulsidas. Many of them say according to the Vikrami Samvat that he took birth in 1554 and other say it was 1532. He lived his life around 126 years. According to the legend, Tulsidas took the 12 months to come out to the world, till then he stayed in the womb of his mother. He had all the 32 teeth from his birth and looks like a five year old boy. 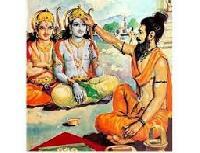 After his birth, he told Rama word instead of crying. That?s why he named as Rambola, he himself had stated in Vinayapatrika. At the fourth night after his birth his father had passed away because of the danger to life. Tulsidas had stated in his works Kavitavali and Vinayapatrika about his parents abandonment after his birth. Chuniya (the female maid of his mother Hulsi) took Tulsidas to her town, Haripur and took care of him. She died after caring him for just five and a half years. After that event, Rambola lived as a poor orphan and walked door to door begging for alms. It is assumed that the Goddess Parvati took up the form of a Brahmin for taking care of the Rambola. He himself had given some of the facts and events of his life in his various works. Two ancient sources of his life are the Bhaktamal and Bhaktirasbodhini composed by the Nabhadas and Priyadas respectively. 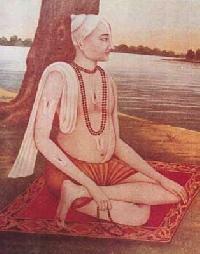 Nabhadas had written in his writing about Tulsidas and described him as an incarnation of the Valmiki. Priyadas composed his writing 100 years after the death of Tulsidas and described the seven miracles and spiritual experiences of the Tulsidas. Two other biographies of Tulsidas are Mula Gosain Charit and Gosain Charit composed by Veni Madhav Das in 1630 and Dasanidas (or Bhavanidas) around 1770 respectively. 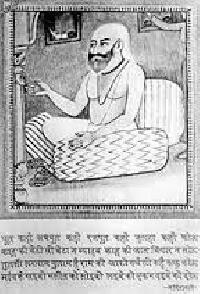 It is believed that Tulsidas was the reincarnation of Valmiki. According to the Hindu scripture Bhavishyottar Purana, Lord Shiva had described to his wife Parvati that how Valmiki will incarnate in the Kal Yuga.According to the sources, it is considered that the Hanuman was used to go to Valmiki to hear him singing the Ramayana. After the triumph of Lord Rama over Ravana, Hanuman was continued to worship the Rama at Himalayas. Rambola (Tulsidas) was given the Virakta Diksha (known as Vairagi initiation) and got the new name, Tulsidas. His Upanayana was performed by the Narharidas at Ayodhya when he was just of 7 years old. He started his first learning at the Ayodhya. He mentioned in his epic the Ramcharitmanas that his guru narrated him the Ramayana over and over again. He came to the sacred city Varanasi when he was just 15?16 years old and got the knowledge of Sanskrit grammar, Hindu literature and philosophy, four Vedas, six Vedangas, Jyotisha from his guru Shesha Sanatana at the Pancaganga Ghat in Varanasi.After study, he came back to his birthplace, Chitrakuta by the permission of his Guru. He started to live in his family home and narrating the story of Ramayana. According to the Mula Gosain Charita and some other works, Tulsidas was married to Ratnavali on the thirteenth day of the bright half of the Jyeshta month (May?June) in Vikram 1583 (1526 CE). Ratnavali was the daughter of Dinbandhu Pathak, a Brahmin of the Bharadwaja Gotra, who belonged to Mahewa village of Kaushambi district.They had a son named Tarak who died as a toddler. Once when Tulsidas had gone to a Hanuman temple, Ratnavali went to her father's home with her brother. When Tulsidas came to know this, he swam across the Yamuna river in the night to meet his wife. Ratnavali chided Tulsidas for this, and remarked that if Tulsidas was even half as devoted to God as he was to her body of flesh and blood, he would have been redeemed. 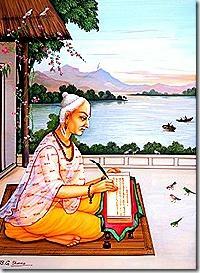 Tulsidas left her instantly and left for the holy city of Prayag. Here, he renounced the Grihastha (householder's life) stage and became a Sadhu (Hindu ascetic).Some authors consider the marriage episode of Tulsidas to be a later interpolation and maintain that he was a bachelor.They include Rambhadracharya, who interprets two verses in the Vinayapatrika and Hanuman Bahuka to mean that Tulsidas never married and was a Sadhu from childhood. Tulsidas meet the Hanuman at his own Katha, he fell at the Hanuman?s feet and shouting that I know who you are so you cannot get away leaving me. Then, the Hanuman blessed him a lot. 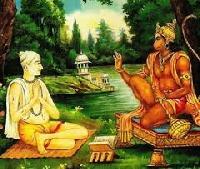 Tulsidas had expressed his feeling in front of Hanuman that he want to see Rama confronting each other. 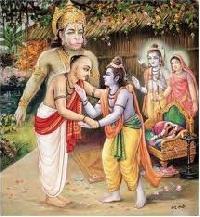 Hanuman guided him and told that go to the Chitrakuta where you would really see the Rama. After getting instructed with the Hanuman, he pursued the instructions of Hanuman and started to live in the Ashram at Ramghat in Chitrakuta. One day when he went for making the Parikrama of the Kamadgiri Mountain, he saw the two princes on the horsebacks. But he could not distinguish them. Later when he acknowledged that they were Rama and Lakshman by the Hanuman, he got disappointed. All these events are described by himself in his writing Gitavali. On the next morning, he met Rama again when he was making sandalwood paste. Rama came to him and asked for a Tilaka with sandalwood paste, in this way he had a full sight of the Rama. Tulsidas was so happy and he forgot about the sandalwood paste, then Rama took tilak himself and applied on his forehead and also on the Tulsidas?s forehead.In the Vinayapatrika, Tulsidas had mentioned the miracles at Chitrakuta and lot of thanks to the Rama. He got darshan of the Yajnavalkya (speaker) and Bharadvaja (listener) in the Magha Mela under a banyan tree. Tulsidas had composed the Statue at Tulsi Manas Mandir, Chitrakuta, Satna, India. He then started to compose poetry in the Sanskrit at the listener in the Varanasi. It is considered that Lord Shiva himself had ordered him to compose his poetry in the vernacular language instead of the Sanskrit. When Tulsidas opened his eyes, he saw that both Shiva and Parvati had blessed him. He ordered to go to Ayodhya and write his poetry in the Awadhi. 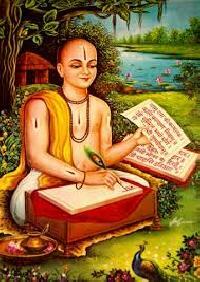 He started to write the Ramcharitmanas in Ayodhya on the Ramnavami of the Chaitra month in the year 1631. 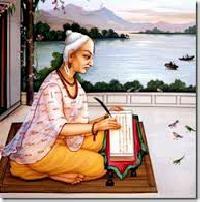 He completed his writing of the Ramcharitmanas in two years, seven months and twenty six days in the year 1633 at the Vivaha Panchami (marriage day of the Rama and Sita) of the month Margashirsha.He came to the Varanasi and delivered the epic Ramcharitmanas to the Lord Shiva and Mata Parvati at the Kashi Vishwanath Temple. Another legend tells us that Tulsi would pour some water at the base of a banyan tree when he passed that way after his morning ablutions. A spirit that was suffering the effects of past evil deeds lived on that same tree. Tulsi?s offering relieved the spirit of its agony. Wanting to express gratitude to Tulsi, the spirit asked him what he wished. What else would Tulsi want but the holy darshan of Sri Ram? The spirit replied: ?An old man attends your discourses; he arrives first and is the last to leave. He will help you.? The next day, Tulsidas identified the man who answered to the description and fell at his feet. The old man told Tulsi to go to Chitrakut, where he would have the darshan of Sri Ram. Who could the old man be but Hanuman himself ? It is well known that Hanuman is always present wherever the name ?Ram? is being uttered. Tulsi remained in Chitrakut, making sandal paste and giving it to the devotees who came there. One day, while he was making the paste, Sri Ram appeared in front of him and said: ?Baba, give me some sandal paste.? Tulsi was overwhelmed and went into samadhi. Sri Ram applied sandal paste to Tulsi?s forehead with his own hand. Tulsi remained in samadhi for three days. This was the first time he experienced samadhi and that through the darshan of Sri Ram himself.Once during his visit to a temple of Sri Krishna in Vrindavana, Tulsidas addressed the deity: How can I describe your heavenly beauty, O Krishna! However, this Tulsi will not bow to you unless you take a bow and arrow in your hands! ? In a moment, Tulsi had a vision of Sri Ram instead of Sri Krishna on the altar. It is believed that the Mughal Emperor Jahangir knew about Tulsidas and that they met at least once. Jahangir pressed Tulsidas to perform a miracle. Tulsi refused saying: ?I know no miracles, I know only the name of Ram.? Annoyed at the answer, Jahangir imprisoned him. The legend narrates that a band of monkeys wreaked havoc in the prison and the emperor, realizing his mistake, had to release Tulsi.The famous pandit Madhusudana Saraswati of Varanasi was a contemporary of Tulsidas.